...my handmade Peter Pan Blouse! A couple of months ago I bought a book about sewing vintage clothing. 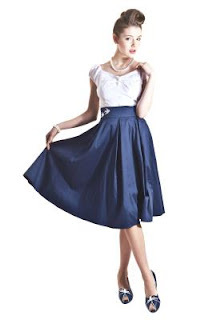 I really love vintage clothes (as you may have guessed by my Wanted posts) and I love sewing, but to find nice patterns now a days isn't a simple task. The book is written by Gretchen Hirsch (Gertie) and not only is she describing in detail how to get certain skills, like making button holes, how to sew a nice lining and such, she also added a lot of very nice patterns. I want to make them ALL, so that says enough about the beauty of the designs. 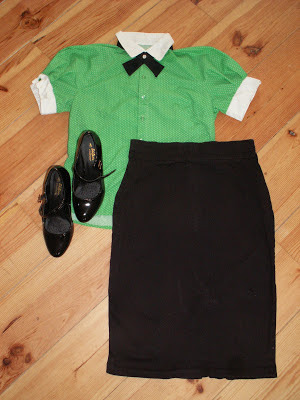 Today I show the first item I made from her book, the Peter Pan Blouse. 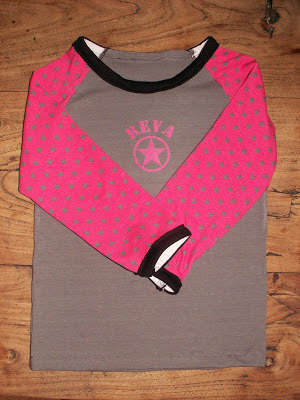 I really love Raglan Shirts and when I saw this lovely jersey with pink stars, of course I had to buy it to make a new shirt for my youngest! The pink star on the front is an iron on that I bought on the internet. Navy Wifey Peters aboard the USS Crafty and also by D. from The Shady Porch. Last week I made this Lunch Bag, as you may have seen, and to embellish it a little I hung a heart of polymer clay from it. Today I will show you how I made the heart. 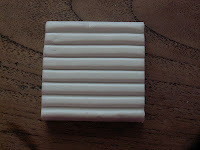 Cut the banner out of the white clay and the heart out of the red clay. You can also use a cookie cutter for the heart. Fold the banner on both sides, like I did in the picture below. Stick the banner on the heart. That's all you have to do with the clay, so you can put it in the oven now (read instructions on the clay package), but don't forget to attach the eyelet before! If you try it afterwards the clay will break. After baking the clay let it cool down. When the clay is cool enough, paint the red part of the heart with nailpolish, if you like your heart shiny (optional). 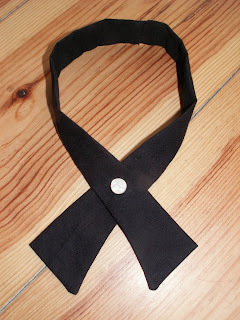 It's not very difficult to make one yourself, but if you rather buy one, you can find them at Flapper Girl's etsystore. This week my Lavender Sugar Scrub was featured by The T2 Women! 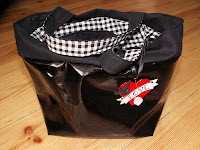 I still love the pattern and how the bag ended up, so when I found this patent leather look-a-like fabric that I bought years ago, but never knew what to do with, the Lunch Bag came to my mind. 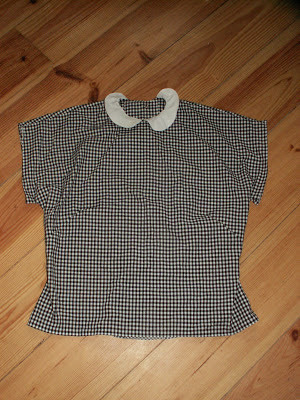 I had some black gingham left over from a blouse that I made last week, but that's still waiting for some buttons, and some black cotton. Just enough to make the bag! And here is a detail of the Old School Tattoo Love Heart, that I made of polymer clay, red nailpolish, a permanent marker and cabochons of a pink rose and a swallow. ...my handmade marine colored Necklace? Last week I bought this circle skirt and when I was in my local craft store, I found little beads in exactly the same color. 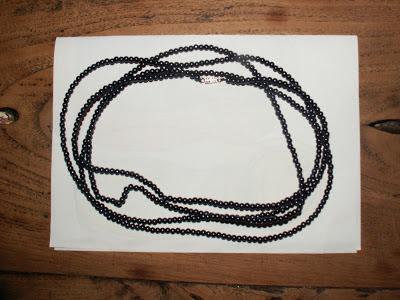 I made a long necklace with them, which I can wrap around my neck, like in the picture. The beads are a pearly marine color (not very clear to see in the picture) and my skirt is blue satin, so they match perfectly! This week my Clay Cat is featured by Pam's Party & Practical Tips! Finally, finally, fi-nal-ly the baby blanket for my friend is finished!!! And although I really like the rippled pattern, I will never use this stitch again for a blanket. It takes forever to finish just a little baby blanket. 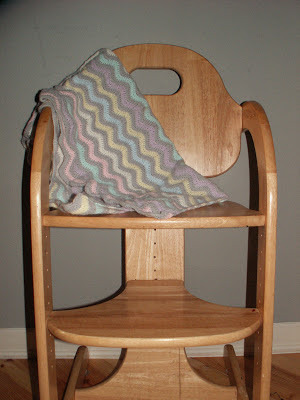 I used a variety of pastel colors for the blanket, in combination with grey. These are the colors my friend said she wants to use for the baby room, so I hope this blanket will fit right in. I want to make two matching baby sheets with the blanket, a pink one and a lila one. The baby is expected to be born at the end of august, so there's plenty of time to make more stuff. And, let's not forget, I already made this Baby Pyramid Toy. I also made a Lila Baby Blanket for my friend, but two blankets is a bit on the excessive, so I will give the lila blanket to a colleague. Yes, I have lots of expecting people around me :-) ! A couple of months ago I found a recipe for Lavender Scrub at Now is Magic and wanted to make that scrub since then. Today was the day! I bought cocos oil, lavender oil, food coloring and some nice pots. 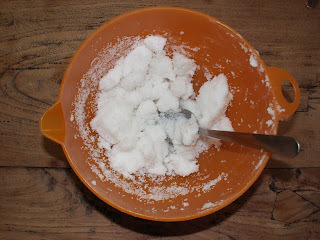 I put equal parts cocos oil and sugar in a bowl and mixed them together with a hand mixer. After that I added a few drops of food coloring and some drops of essential lavender oil and mixed again. I put the mix in the pots and that was all it took! Only ten minutes work! You can find the whole tutorial here, at Now is Magic! 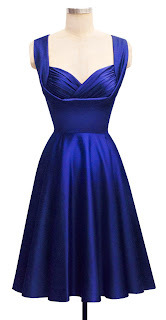 This week my Twirl Dress was featured by Claire Justine! !